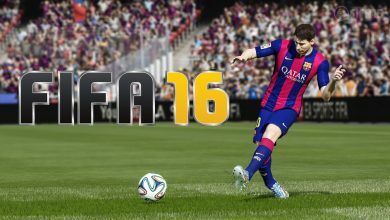 In recent years, digitally released videogames have grown to become an increasingly large and important part of the gaming landscape, and while this has certainly opened the floodgates and unleashed a sea of low-quality, lowest-common-denominator garbage and grotesque displays of greed, obviously this isn’t always the case – there have been countless excellent digital games released, and this certainly seems set to continue for the foreseeable future. 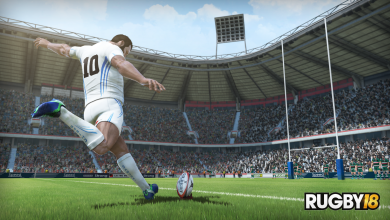 This feature is the first in an ongoing series I’ll be calling “Digressions In Digital”, with each feature under this banner focusing on a particular digitally released videogame which I find interesting. These games may not be perfect or even rank amongst my favourite digital games, but they are titles I consider to be worth writing about. Being a big fan of the horror genre, the first digital game I’ve decided to look at is Outlast, the first-person horror title developed and published by Red Barrels, who released the game on PC in 2013 and then PlayStation 4 and Xbox One in 2014. I’ll also be briefly discussing the Whistleblower expansion which was released after the main game. Outlast opens with an amusing nod to classic survival horror games in the form of the following message: “Outlast contains intense violence, gore, graphic sexual content and strong language. Please enjoy.” Will do. The game casts you as ambitious investigative journalist Miles Upshur, whose current investigation into the shady and ruthless Murkoff Corporation leads him onto the grounds of Mount Massive Asylum, an isolated psychiatric hospital owned by the company. Miles is determined to expose Murkoff and so you enter the asylum and soon learn that the company has been carrying out nightmarish experiments there – needless to say, something has recently gone horribly wrong and now the asylum has been overrun by the patients, many of whom are homicidal maniacs. 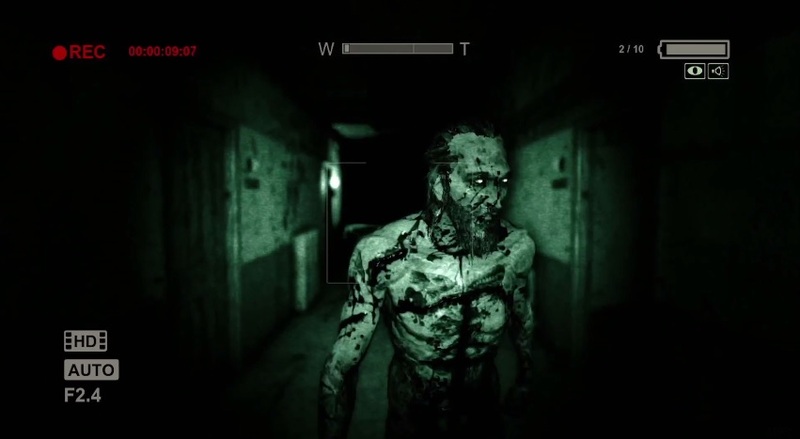 One of the main reasons why Outlast gained the attention it did during its pre-release build-up and afterwards is because of its central gameplay mechanic which also gives the game a recognisable visual identity: the night-vision-enabled digital camcorder Miles takes with him into Mount Massive Asylum. 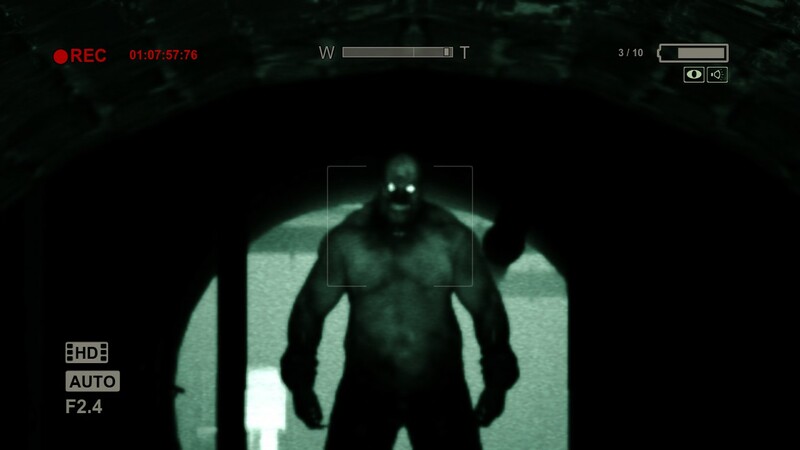 The camera’s night-vision capability is essential in navigating the darker parts of the asylum, the visual mode giving everything a grainy, green glow and causing characters’ eyes to glow in the dark – a cool, eerie touch. 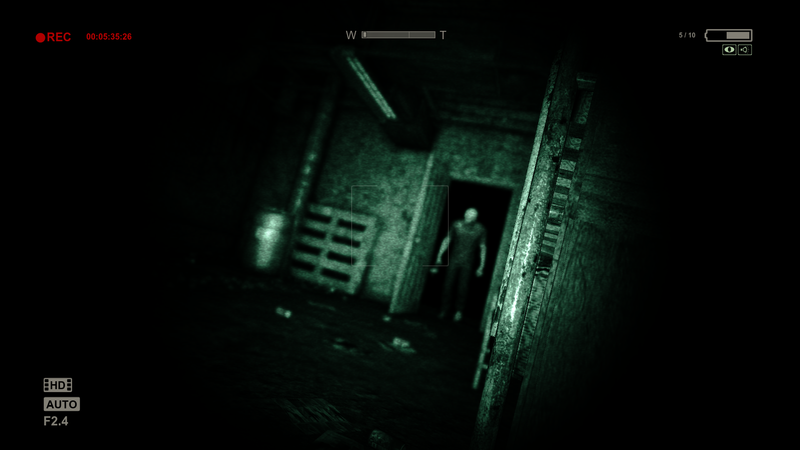 The night-vision along with the fact that you spend time viewing events through your camcorder clearly indicates that Outlast was inspired by the “found footage” subgenre of horror movies, a subgenre which, although oversaturated in recent years, can still be very effective when done well. The camera can be raised or lowered with the press of a button and it has a zoom function. More importantly, though, is the fact that the night-vision mode consumes battery life when enabled, encouraging you to collect the batteries scattered around the game’s environments. You can carry a maximum of ten batteries and although there were a couple of times during the game when I was down to one or two batteries, thus increasing the tension, on the whole I usually had enough that running out wasn’t a concern. 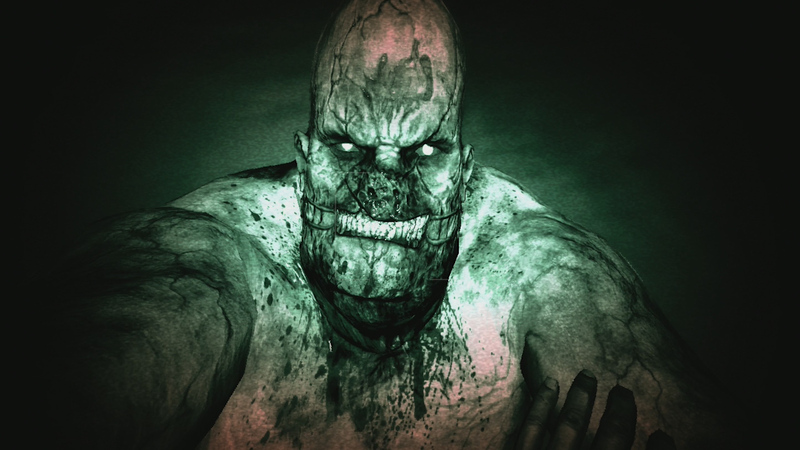 Alongside the camera, another key element of Outlast’s gameplay is the fact that Miles has absolutely no combat options – while roaming the halls, rooms and tunnels of Mount Massive Asylum, it apparently never occurs to Miles that it might be a good idea to arm himself, even if only with a shard of glass, a pointed stick or a sheet of paper (your enemies may be insane but come on, everyone hates paper-cuts). Instead, players are forced to navigate the asylum unarmed – when faced with an enemy, you either run or hide. Luckily, Miles is fairly agile and can vault over or climb onto low obstacles, crawl through ventilation ducts, sidle along small ledges, climb ladders and jump small gaps. As for hiding, you can hide inside lockers or under beds, although if an enemy is already looking for you then they might find you and drag you out, forcing you to run. Outlast’s visuals are detailed and immersive, the art direction perfectly complimenting the sinister atmosphere the game attempts to convey, while the various sections of the asylum – offices, a prison, a sewer system and more – are interesting enough that repetition doesn’t set in. A particular highlight is a pitch-black exterior courtyard which you have to navigate via your camera’s night-vision mode while rain pours down and lightning flashes above you. One graphical choice worth mentioning is the game’s constant use of a slightly grainy filter over the visuals – it’s noticeable but subtle enough that it’s never distracting and it really suits the grimy, run-down aesthetic of many of the game’s locations. Also, Outlast is a visually dark game, filled with lots of deep shadows and pitch-black areas, and Red Barrels did a great job of implementing this darkness while striking a nice balance between light and darkness on the whole. The soundtrack is decent, providing intense, fast-paced music for action-focused moments, and more subtle music for quieter scenes. Annoyingly the game doesn’t include individual sliders for music, sound effects and dialogue, and when I was playing, the music would sometimes drown out character dialogue. One time this occurred was near the end of the game and with a character integral to the story – I missed the majority of his plot-related exposition because I couldn’t hear him over the music. Performance-wise, Outlast ran smoothly and the only bug I encountered came at a point near the end of the game where if I was killed during a certain enemy encounter, the game would become stuck on a black screen, forcing me to quit to the main menu rather than restarting from the most recent checkpoint as was supposed to be the case. 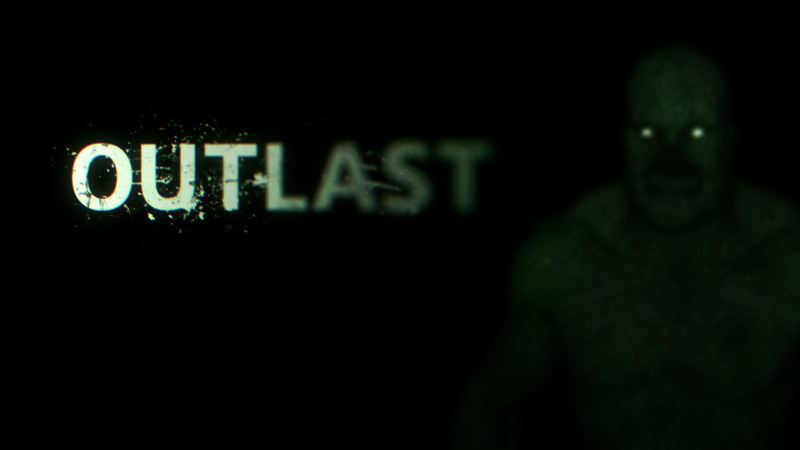 In terms of its story and characters, Outlast is a mixed bag. Miles isn’t given much depth and, apart from his occasional fearful panting and pained cries, is a silent protagonist. A few of the reoccurring enemies are actually the highlights in terms of the cast, such as “the twins” – a pair of musclebound cannibals armed with machetes, who speak in soft, sinister tones and who walk after you rather than run, making them even more menacing. 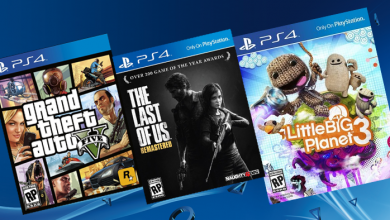 Oh, and they’re completely naked too, so if you bought your PlayStation 4 in the hope of playing games featuring crazy men’s wangs then Outlast has you covered. 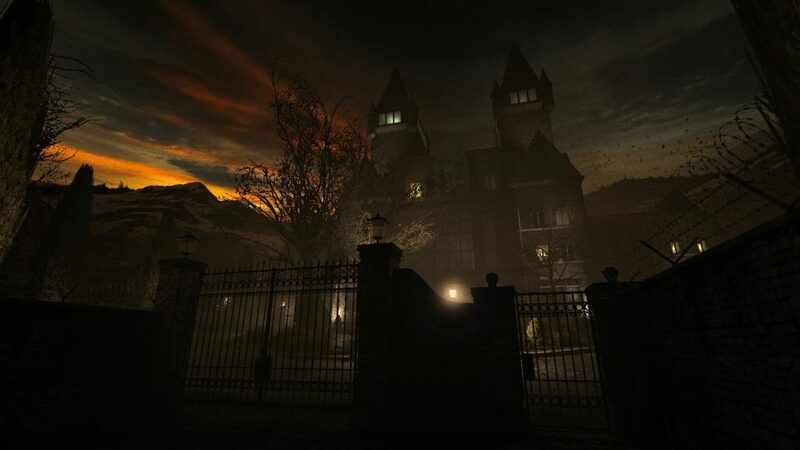 Soon after the player enters Mount Massive Asylum, the crux of the plot – not to mention the player’s ultimate objective – becomes Miles’ efforts to escape the asylum while simultaneously recording what he can of the horrors perpetrated by the Murkoff Corporation so that he can expose them once he has escaped. As you progress, aspects of the plot are explained within documents which can be found around the game’s environments, some being harder to find than others. Although the story starts out interestingly enough, in the end the plot turns out to be pretty unremarkable, becoming more convoluted and confusing in the final act as the game heads towards a rather unsatisfying conclusion. While the atmosphere and setting are executed very well, I can’t say the same of the actual story, which is a shame. But a horror game doesn’t need great writing to be a great horror experience, so is this the case with Outlast? Personally, I’d say the actual horror aspect of the game is good but not great, as it’s very blunt and straightforward: lots of jump-scares (a handful of which are very well-implemented, to the game’s credit), blood and gore, basically. Horror can often be much more effective when handled in a subtle and psychological manner but Outlast has no interest in this approach. Whether or not this makes the game more or less appealing to you is of course down to personal taste. A few months ago I saw an internet comment that compared Outlast to a ghost train-style fairground ride and I think that’s a pretty apt comparison as the path through the game is very linear, your level of interactivity is extremely limited and the scares are in-your-face. And this brings me to the main problem I had with Outlast: the fact that it’s a videogame offering little in the way of actual gameplay. As I said, there is precious little interactivity between you and the game-world – environments are extremely static, with almost no objects reacting to your in-game physical presence. You can open some doors and push obstacles in front of others to slow down pursuers, and not much else. Also, your battery supply is the only form of resource management in the game, so there’s little of interest here as well. And as for your actual objectives, these are repetitive and basic, usually being limited to instructions such as “Go here”, “Find this object” and “Turn these valves”. And while leaving out combat in favour of stealth is obviously a perfectly valid design decision, Outlast is a stealth-focused game without any real stealth mechanics in place beyond running and hiding – it’s stealth at its most basic, never trying to bring anything innovative or even interesting to the table. Agent 47 would no doubt be tutting in disapproval from inside his giant chicken costume. This lazy approach and the often sloppy results that ensue are best exemplified in the numerous scripted sequences that crop up over the course of the game, ones in which you’re being hunted by a specific enemy or enemies. Often you’ll be spotted, which turns the scene into a chase sequence as you rush around looking for the way out while your pursuer takes clumsy swipes at you whenever they manage to get close enough. Such scenes are usually a case of trial-and-error: take a wrong turn, get killed, restart at the most recent checkpoint; take another wrong turn, get killed, restart; and so on until you stumble across the actual exit. While these scenes can be tense and adrenaline-pumping the first time they occur, if you end up having to repeat them several times then they suddenly stop being scary or exciting and simply become annoying. As I said, it just feels sloppy, and it makes me wonder how much better the game could have been if the developers had made the effort to include a more fleshed-out and interesting stealth system. 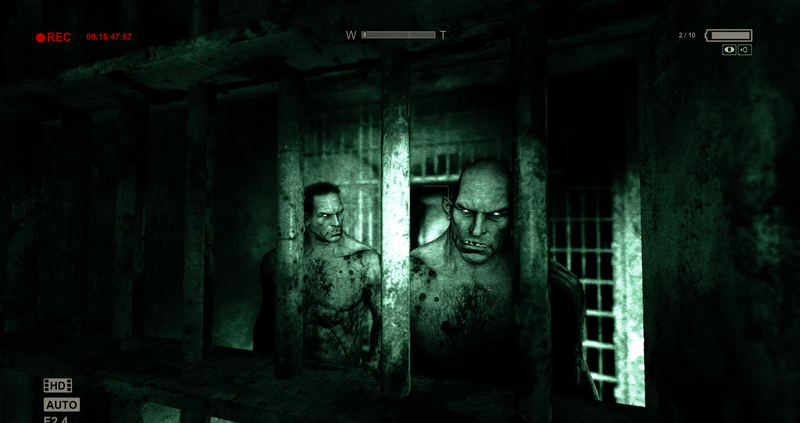 Outlast received downloadable content after its initial release in the form of the Whistleblower expansion, which stars a new protagonist while mostly spanning the same time period as the events of the main game. 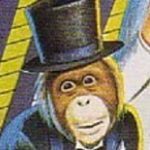 There are cameos by some of the characters from the main game while the DLC also introduces a couple of new antagonists, by far the most memorable of whom is Eddie Gluskin, a.k.a. 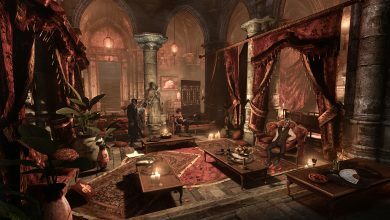 “The Groom” – Gluskin and your encounters with him provide arguably the most disturbing content across both the expansion and the main game. While the Whistleblower DLC does expand upon Outlast’s overarching story, sadly it doesn’t offer anything new in terms of gameplay. The camera mechanic is present because it remains Outlast’s defining feature, despite it being shoehorned in from a narrative point-of-view; and no more effort has gone into the stealth system than is already present in the main game. Solid Snake would no doubt be tutting in disapproval from inside his cardboard box. For good or bad, Whistleblower is essentially more of the same – if you like the main game then buy it, if not then there’s nothing in the DLC that will change your mind. I’ve listed what I see as glaring flaws in Outlast, and while I think my criticisms are valid ones, that’s not to say I didn’t enjoy the majority of the time I spent with the game. It’s a decent horror game that is certainly worth playing if you’re a fan of the genre, it’s just a shame about the shallow gameplay and the annoying trial-and-error aspect. 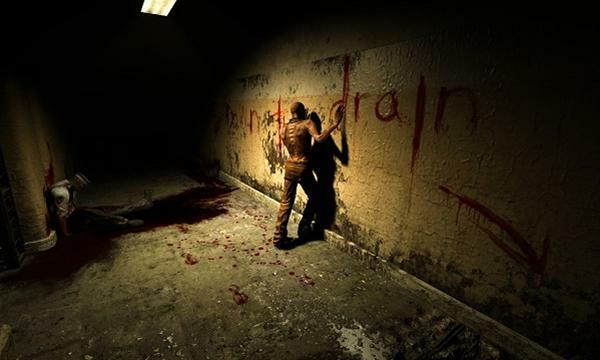 I don’t think Outlast lives up to its potential but there’s nothing stopping it from doing so in a future instalment in the series, and in October 2014, Red Barrels announced that a sequel is in development. While I’m interested in seeing how this sequel turns out, I just hope that the creators can add some much-needed depth to the gameplay and move beyond the limited, ghost train-style design to make Outlast 2: Naked Maniac Boogaloo a varied and exciting carnival of horrors.